G. Rodo Boulanger born 1935 – Graciela Rodo Boulanger’s joyful scenes depict the pleasures of childhood in a childlike way. Born in La Paz, Bolivia, Graciela Rodo Boulanger was raised in an artistic environment. She studied piano with her mother, and it was at the age of 25, after having studied music in Chile, Austria, and Argentina, that she decided to devote herself to her creative expression, which is painting. Since her first one woman show in Vienna, 1953, she has worked in many other mediums beside oil painting: etching, lithography, water colour, pastel, sculpture and tapestry. Pursuing her dream to be both a great artist and musician, Rodo soon found that time would not permit the necessary devotion to both her passions. At 22, she turned all of her energy to painting. 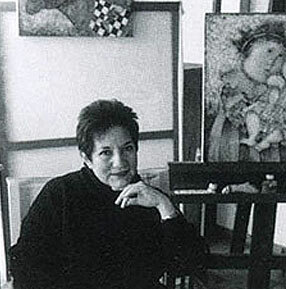 She studied etching and printmaking along with René Carcan under Johnny Friedlaender in Paris. She married a Frenchman, Boulanger, so that her public name became Graciela Rodo de Boulanger (Spanish) and Graciela Rodo Boulanger (French).